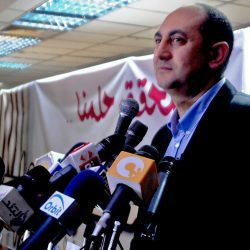 BHRC, along with its partner EuroMed Rights have published its trial observation report for the appeal case of Khaled Ali, a prominent Egyptian lawyer who was expected to run for President in the election on 26-28 March. Ali was convicted in September 2017 for violating public decency in relation to the “making of an obscene gesture” outside the Supreme Administrative Court following the celebration of a victory in court, concerning the Red Sea Islands. He appealed both his conviction and sentence and was granted bail pending appeal. The trial and initial appeal proceedings were ongoing when Khaled Ali was a presidential candidate. He has since withdrawn his candidacy. Khaled Ali and his lawyers claim that the charges and conviction against him are politically motivated. Some international observers, including Amnesty International and the Cairo Institute for Human Rights Studies have also condemned his conviction as unfair and politically motivated. The first substantive stage of the appeal proceedings was heard on 3 January 2018 in the Dokki Misdemeanour Appeals Court at the North Giza Courthouse, Cairo, Egypt. The second substantive hearing took place on 8 March 2018 in the same Court. BHRC observed both substantive hearings of the appeal sponsored by EuroMed Rights. Observers also interviewed Khaled Ali and a member of his defence team as well as the judges and the prosecutor for the case. The nature of the charge and fact of the proceedings, particularly when placed in the context of the use of criminal proceedings against other potential candidates in the presidential elections gives BHRC cause for serious concern and it will remain engaged with the appeal as it progresses. In its report, BHRC also took the opportunity to reiterate some of the recommendations it has previously made in relation to the systemic issues identified within the Egyptian criminal justice system. Defendants must be provided with the opportunity to communicate confidentially with their lawyers to enable them to prepare their defence. The lack of provision for confidential client-lawyer communications, both in detention and at court interferes with a defendant’s right to a fair trial. Evidence which the Prosecutor relies upon must be disclosed to the defendants, as well as presented to the court in a timely manner, to enable a proper defence. Case management procedures should be put in place to assist the Court in efficiently managing its case load and avoiding lengthy adjournments. BHRC issues statement by QC on recent fair trial abuses in Zimbabwe after observing trials in Harare.